George W. Bush: Bill Clinton is a "brother with a different mother"
Former presidents George W. Bush and Bill Clinton shared a stage Thursday night at a leadership summit in Dallas to share what they've learned in their days before, during and after the presidency. 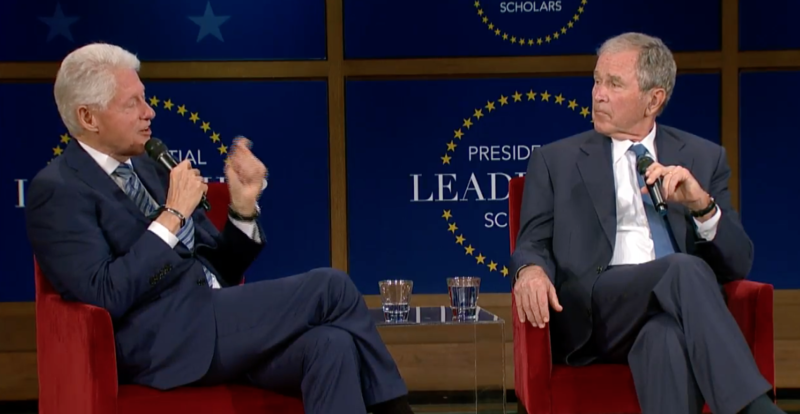 The two former presidents, although they're from opposite parties, said they share much in common, they noted at a Presidential Leadership Scholars conference at the George W. Bush Presidential Center. They are two of only 13 presidents in U.S. history to serve two consecutive terms, and Mr. Bush, at 71, is only 44 days older than Mr. Clinton, 70. They were also both governors of southern states -- Mr. Bush of Texas, and Mr. Clinton of Arkansas. Mr. Bush's father, former President George H. W. Bush, also aided Mr. Clinton as he entered the presidency in 1992, as Mr. Clinton in turn did for the younger Mr. Bush in 2000. To this day, Mr. Clinton has annual visits with George H. W. Bush. The pair joked about their friendship, despite Mr. Clinton beating Mr. Bush's father in 1992. Mr. Bush said it "starts with [him] being a person refusing to lord his victory over dad. Dad was willing to rise above the political contest. Both men displayed strong character. Why do I have a friendship with him? Well, he's called a brother with a different mother." Mr. Clinton said he wouldn't trade having those two presidential terms for more time as a private citizen. "You've got to live a long time as a former president to impact as many people as you can as president," Mr. Clinton said. In the time since leaving the White House in 2000, Mr. Clinton said he's realized the country gave him something "priceless," and "you owe something back." Mr. Bush joked that the day after leaving office, he woke up and no one brought him coffee. "Laura didn't bring me the coffee," he said. Post-presidency, Mr. Bush offered simple reason for why he took up painting, a hobby that has attracted some attention from the public. "I painted because I was bored," he said. In more recent days, Mr. Clinton said his wife, 2016 Democratic presidential nominee Hillary Clinton, is doing well. "Good if you know our grandkids you know she's good," he said. "She's doing good and working on a book." But Mr. Clinton also had some words of caution for the future. He noted that in today's digital age, people "get news in silos," and, without mentioning President Trump said the U.S. "can't continue to grow this economy" without immigrants. "One of things wrong with America is we have separated ourselves in like-minded communities," Mr. Clinton said. "We don't want to be around with people who disagree with us typically. And we get news in silos. Diverse groups make better decisions then homogenous ones." To anyone hoping to run for president, Mr. Clinton said they need to answer a fundamental question: "But why in the heck are you running?" "If you want to be president, realize it's about the people, not about you," Mr. Clinton added.